Last year, I decided that I needed a paradigm shift. It was not a decision that came either naturally or easily. I had been unemployed for several months, and as my unemployment had been several months coming (i.e., I knew I was facing displacement if I couldn’t find another job within my company), I found myself under increasing stress, with anger building. The onset of anger was both steady and uncontrollable. I had difficulty placing blame with my employer; afterall, my faculty were leaving the university, and after their departure, there would be no work for us – the small unit of people who worked to support them. So, after the faculty were gone, there was no choice for the big boss other than to release us to our own devices, to find other employment or else. I found little to no pleasure in daily activities, found myself crying more than usual (I have always been a softie for those tender moments so often found in catfood commercials), and certainly did not want to talk about any of these things unless I’d had a pint. One of my greatest sources of ire, for at least the previous year, had been our dog, Ten Bears. 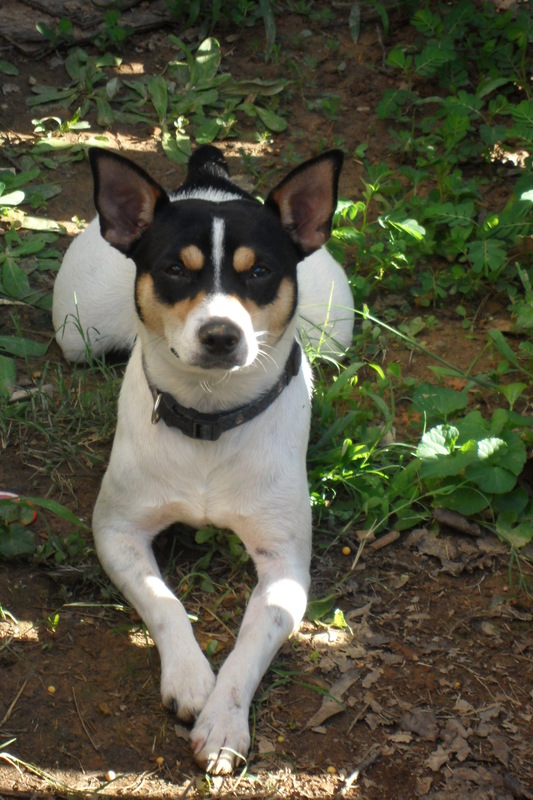 He is a rat terrier, maybe 18 pounds. He is a very sweet pooch, but can be quite difficult. Let me give you an example. If you are near the backdoor, he jumps on the door. If he can hear you in the house, he jumps on the backdoor. If you are inside asleep, and he thinks that he should also be inside asleep, he jumps on the backdoor. And “jumps” is quite an inadequate description for relating what he does. If you were new to my home and the curtains were closed, you would hear a rhythmic noise; tsk tsk tsk bump. tsks tsk tsk bump. Tsk tsk tsk bump. The “tsk” is his feet running up the door, and the “bump” is when his feet hit the floor. It is so rhythmic, in fact, that I suspect you could set a metronome to the beat of his jumping. It happens in a 1:2 count; the tsks are one beat in quick triads, with the bump being the other beat. His jumping has awakened me from sleep, and I thought maybe some weird, out-of-balance washing machine was running. Or I had forgotten to unplug some appliance, but the kind that is unknown to those who are actually awake, and only exist in that half-asleep part of our brains that can imagine such things. And I should add that he knows he is not supposed to jump. He always realizes, after seven or eight goes at the door that I WILL NOT open it to go outside or let him in until he sits down. In any case, one night, as I stood inside the laundry room door watching Ten Bears jump and jump, resisting the urge to rush outside and strangle him rather than hear that “tsk tsk tsk, bump” one more time, I decided that it might be in both of our best interests to think of his jumping in a different way. Maybe he was jumping because he was so excited that I would be coming outside to see him. Perhaps he was just showing me, in advance, how glad he was to be receiving another meal. And maybe his jumping was just a way to let me know that he was happy. I have to admit that it did take practice on my part. Each time I went to the door and thought, “Oh, you stupid idiot, will you stop jumping on the goddamn door,” I would stop myself before the thought was complete, and refocus my consciousness to instead say something along the lines of, “Oh, look how happy you are to see me!” Another option was, “You are just so enthusiastic!” And each time I said it, I did sort of believe it. Afterall, he was an enthusiastic dog; too enthusiastic to contain himself! It forced me to admit that, even though his behavior was hair-rippingly obnoxious, he was still happy to see me, the provider of his food and scratcher of his unreachable itchy spots. It was a new chapter in our relationship. I found myself reaching down to pet him more often (but only if he were sitting, as he knows is appropriate if he wants a pat on the head), and talking to him more – telling him what a good boy he is, and how pretty he looks when he is sitting. But because I’d had a paradigm shift about the dog’s behavior and that had improved my life, if only for a few minutes each day, I found myself wondering how I could further improve my life by broadening my tolerance for other irritations that I was having a hard time accepting. When I eventually found employment again, I admit that it was harder to take this lesson into the workplace; I suppose it was because those people did not live in my backyard and depend on me for sustenance, but I had a personal lesson that was at least relate-able. Perhaps that girl is so difficult because she had a crappy childhood and craves acceptance, but just doesn’t know how to get it without being a bully. Maybe that guy who shows blatant favoritism in public and every chance he gets is that way because he has no personal boundaries, and his wife criticizes and emasculates him to no end each night of his life. Even the girl who appears to be snooty and never speaks – maybe she is so painfully shy that she sets up an image, unintentionally, of an impenetrable fortress that no one else around has the self-confidence to breach. Or, maybe none of these people are in the least bit ill-intentioned, but instead are just regular people, like myself, trying to make it with the skills they have. If so, nothing is needed but a paradigm shift from me. These people owe me nothing; what I owe them, however, is simply the promise that I will do what I can to understand them and how they fit into my world. For afterall, this is my experience, colored by my outlook and my perceptions, and it can only be as good or bad as I choose to make it. More simply, I owe it to myself to be more understanding and forgiving of others, for only then can I understand myself. I admit that from time to time, I find myself wanting to kick that damn dog harder than if I were a special-teams football player, but as long as I can find the sense to remind myself that he means me no harm, and his jumping is affectionate (in the nicest terms, of course), then I can usually bring myself back around to a place of peace, in spite of his persistent, albeit loveable habit. Any time that I spend wishing that he would stop is time that I could be appreciating who he is, and in my new paradigm, I would rather do the latter. i have read this twice today in hopes that it’ll rub off on me. I can only say that I hope that it helps in some small way. Even when you’re the one writing about it, patience and tolerance is a learned skill.